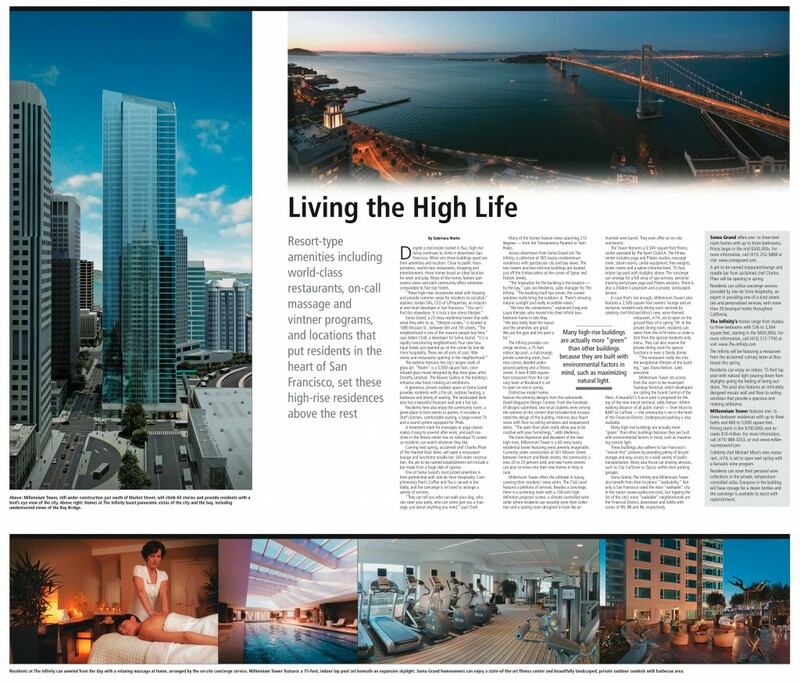 Despite a real estate market in flux, high-rise living continues to climb in downtown San Francisco. What sets these buildings apart are their amenities and location. Close to public transportation, world-class restaurants, shopping and entertainment, these homes boast an ideal location for work and play. Many of the homes feature panoramic views and each community offers amenities comparable to five-star hotels. Dorothy Lenehan. The Reaves Gallery in the building’s entrance also hosts rotating art exhibitions. A generous, private outdoor space at Soma Grand provides residents with a fire pit, outdoor heating, a barbecue and plenty of seating. The landscaped deck also has a beautiful fountain wall and a hot tub. Residents here also enjoy the community room, a great place to host events or parties. It includes a chef’s kitchen, comfortable seating, a large-screen TV and a sound system equipped for iPods. A treatment room for massages or yoga classes makes it easy to unwind after work, and each machine in the fitness center has an individual TV screen so residents can watch whatever they like. Coming next spring, acclaimed chef Charles Phan of The Slanted Door fame, will open a restaurant/lounge and lunchtime noodle bar. Still under construction, the yet-to-be-named establishment will include a bar made from a huge slab of cypress. One of Soma Grand’s most prized amenities is their partnership with Joie de Vivre Hospitality. Complimentary Peet’s Coffee and Tea is served in the lobby, and the concierge is on hand to arrange a variety of services. “They can tell you who can walk your dog, who can cater your party, who can come give you a massage, just about anything you need,” says Chall. Many of the homes feature views spanning 210 degrees — from the Transamerica Pyramid to Twin Peaks. Across downtown from Soma Grand sits The Infinity, a collection of 365 luxury condominium residences with spectacular city and bay views. The two towers and two mid-rise buildings are located just off the Embarcadero at the corner of Spear and Folsom streets. The Infinity provides concierge services, a 75-foot indoor lap pool, a club lounge, private screening room, business center, deeded underground parking and a fitness center. A new 9,000-square-foot restaurant from the culinary team at Boulevard is set to open on-site in spring. Distinctive model homes feature the winning designs from the nationwide Dwell Magazine Design Contest. From the hundreds of designs submitted, two local students were among the winners of this contest that included that incorporated the design of the building. Interiors also flaunt views with floor-to-ceiling windows and wraparound decks. “The open floor plans really allow you to be creative with your furnishings,” adds Medeiros. The most impressive and decadent of the new high-rises, Millennium Tower is a 60-story luxury residential tower featuring every amenity imaginable. Currently under construction at 301 Mission Street, between Fremont and Beale streets, the community is now 20 to 25 percent sold, and new home owners can plan to move into their new homes in May or June. Millennium Tower offers the ultimate in luxury, catering their residents’ every whim. The Club Level features a plethora of services. Besides a concierge, there is a screening room with a 100-inch high-definition projector screen, a climate-controlled wine cellar where residents can securely store their collection and a tasting room designed to look like an inverted wine barrel. They even offer an on-site nutritionist. The Tower features a 5,500-square-foot fitness center operated by The Sport Club/LA. The fitness center includes yoga and Pilates studios, massage room, steam rooms, cardio equipment, free weights, locker rooms and a saline (chlorine-free), 75-foot, indoor lap pool with skylights above. The concierge can arrange for a full array of spa services, personal training and private yoga and Pilates sessions. There is also a children’s playroom and a private, landscaped terrace. In case that’s not enough, Millennium Towers also features a 2,500-square-foot owners’ lounge and an exclusive, resident-only dining room serviced by celebrity chef Michael Mina’s new, wine-themed restaurant, rn74, set to open on the ground floor of in spring ’09. In the private dining room, residents can select from the rn74 menu or order a dish from the special residents-only menu. They can also reserve the private dining room for special functions or even a family dinner. “The restaurant really ties into the exceptional lifestyle of the building,” says Diana Nelson, sales executive. Millennium Tower sits across from the soon-to-be-revamped Transbay Terminal, which developers are calling the Grand Central of the West. A beautiful 5.5-acre park is proposed for the top of the new transit terminal, adds Nelson. Within walking distance of all public transit — from Muni to BART to CalTrain — the community is set in the heart of the Financial District. Underground parking is also available. Many high-rise buildings are actually more “green” than other buildings because they are built with environmental factors in mind, such as maximizing natural light. These buildings also adhere to San Francisco’s “transit-first” policies by providing plenty of bicycle storage and easy access to a wide variety of public transportation. Many also house car-sharing services, such as City CarShare or Zipcar, within their parking garages. Soma Grand, The Infinity and Millennium Tower also benefit from their locations’ “walkability.” Not only is San Francisco rated the most “walkable” city in the nation (www.walkscore.com), but topping the list of the city’s most “walkable” neighborhoods are the Financial District, downtown and SoMa with scores of 99, 98 and 96, respectively. Soma Grand offers one- to three-bedroom homes with up to three bathrooms. Prices begin in the mid-$500,000s. For more information, call (415) 252-5888 or visit www.somagrand.com. A yet-to-be-named restaurant/lounge and noodle bar from acclaimed chef Charles Phan will be opening in spring. Residents can utilize concierge services provided by Joie de Vivre Hospitality, an expert in providing one-of-a-kind amenities and personalized services, with more than 30 boutique hotels throughout California. The Infinity’s homes range from studios to three-bedrooms with 536 to 3,364 square feet, starting in the $600,000s. For more information, call (415) 512-7700 or visit www.The-Infinity.com. The Infinity will be featuring a restaurant from the acclaimed culinary team at Boulevard this spring. Residents can enjoy an indoor, 75-foot lap pool with natural light pouring down from skylights giving the feeling of being outdoors. The pool also features an intricately designed mosaic wall and floor-to-ceiling windows that provide a spacious and relaxing ambiance. Millennium Tower features one- to three-bedroom residences with up to three baths and 660 to 5,000 square feet. Pricing starts in the $700,000s and exceeds $10 million. For more information, call (415) 989-3333, or visit www.millenniumtowersf.com. Celebrity chef Michael Mina’s new restaurant, rn74, is set to open next spring with a fantastic wine program. Residents can store their personal wine collections in the private, temperature-controlled cellar. Everyone in the building will have storage for a dozen bottles and the concierge is available to assist with replenishment. Article published in The San Fransisco Chronicle’s SFiS Chronicle at Home custom publication in November 2008.